Imran Khan, a cricket legend and firebrand nationalist who swept to power in July, has vowed to root out corruption and lift people out of poverty. From creating 10 million jobs to building an Islamic welfare state and restoring Pakistan's tattered image abroad, new premier Imran Khan is facing a problem of his own making: runaway expectations raised by his lofty rhetoric. A cricket legend and firebrand nationalist who is hero-worshipped by supporters, Khan swept to power in last month's election on a populist platform vowing to root out corruption among a venal elite and lift people out of poverty. But he inherits control of a volatile nation facing mounting problems at home and abroad, including a looming economic crisis and a fracture with historic ally the United States over Pakistan's alleged links to militants. Ties are also fraught with neighbours Afghanistan and nuclear-armed rival India. Opponents in parliament talk of forming a grand coalition against Khan, dubbing him a "puppet" and accusing him of entering into a Faustian Pact with the powerful military, which has a history of ousting prime ministers and clashing with civilian governments over control of foreign policy. Khan denies all accusations that the military covertly helped him win the election. And in his victory speech, Mr Khan offered an olive branch to India and called for mutually beneficial ties with the United States. Whether Mr Khan can become the first Pakistani prime minister to complete a full five-year term in office will depend on his relationship with influential generals, analysts say. If his ideas on foreign policy differ from theirs, analysts say Khan would suffer a similar fate to other civilian leaders who have failed to see out their term. "Then his future will be the same as anybody else's," political commentator Aamer Ahmed Khan said. Forced to rely on smaller parties for a razor-thin majority in parliament, and with the opposition controlling the Senate, Mr Khan's coalition government could struggle to push through legislation without major compromises. An increasingly assertive judiciary could also hold it back. Yet the mood in the country is one of unbridled optimism, especially among Mr Khan's young supporters, who believe he can build a corruption-free and prosperous "New Pakistan" for the country's 208 million people. "His biggest challenge is managing expectations among his followers and voters because he's almost promised them the moon," said Raza Ahmad Rumi, the editor of Pakistan's Daily Times newspaper. During Independence Day celebrations this week, when flag-waving Pakistanis flooded the streets of Islamabad, many voiced confidence that Mr Khan would deliver on promises to build world class hospitals and improve education in a nation where the illiteracy rate hovers above 40 percent. "I have moved my daughter (from a private) to a government school, because we are confident that Pakistan is going to change," said Sheikh Farhaj, 40, who volunteered for Mr Khan's Pakistan Tehreek-i-Insaf (PTI) party during the elections. 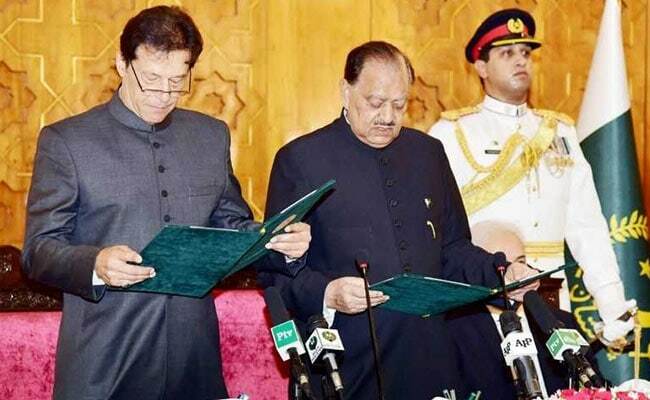 Others were delighted Khan has broken the decades-long dominance of the two dynastic powerhouses, the outgoing Pakistan Muslim League-Nawaz (PML-N) party of jailed former premier Nawaz Sharif and the Pakistan Peoples Party (PPP) of the Bhutto family. "We have great expectations from Imran Khan," said Shah Sultan, 38, a roadside flag seller. "We are lower class people and I voted from Khan because what the politicians have done to our country. They have left it with nothing." But Khan's campaign pledges are likely to be checked by a worsening economic outlook, analysts say, especially his vow to build a welfare state. The central bank has devalued the rupee four times since December, but the current account deficit is still carrying the currency towards a crisis, while the fiscal deficit has ballooned to 6.8 percent of GDP. Economic growth is running at nearly 6 percent, but given the unsustainability of these deficits it is easy to predict Pakistan's growth is heading for a fall. Mr Khan's government must urgently decide whether to request more loans from China, deepening Islamabad's economic reliance on its neighbour, or ask the International Monetary Fund (IMF) for what would be its 15th bailout since 1980. Both lenders are likely to ask for more fiscal discipline, requiring drastic spending cuts. Shafqat Mahmood, Mr Khan's new education minister, said the economic woes pose a major problem but the party is determined to deliver a welfare system and enact badly-needed reforms. "Everyone in the party realises we will have to work overtime to meet these huge expectations," Mahmood said. Mahmood said Khan's image as a politician untainted by corruption could boost faith in the government and convince more people to file taxes in a nation where less than 1 percent of the population pays income tax. Mr Khan has touted his "100 Day Plan" but many of the reforms PTI is proposing, from turning around loss-making state-run enterprises to reforming the tax collection bureau, will take far longer to accomplish. Ending government corruption outright, or repatriating plundered wealth, is also unlikely. "(Khan's supporters) have a simplistic idea that if there is a clean man on top, the entire machinery becomes clean. That's never the case anywhere in the world," said Rumi.